IT’S A PITY how some journalists trivialized the Makati City bus blast last week and made fun of a victim of the tragic incident — the bus driver. 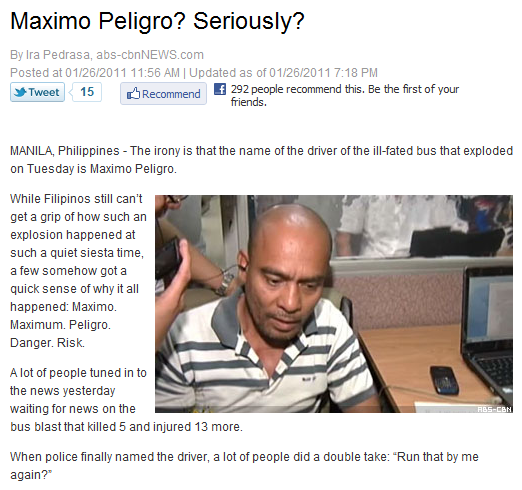 His name is Latinate — Maximo Peligro — which may be roughly translated to “maximum danger”, and which some journalists found newsworthy because of its coincidence with the fate he and his passengers met. While Filipinos still can’t get a grip of how such an explosion happened at such a quiet siesta time, a few somehow got a quick sense of why it all happened: Maximo. Maximum. Peligro. Danger. Risk. …the online community was already abuzz with the unusual name. PopiSunga said: Maximo Peligro? Seriously? The article continues with a list of equally trivializing headlines by other journalists and bloggers. It’s written like a joke, and I wonder if relatives of the five people killed in the bombing found it funny. It seems that the only consolation in the webpage that contained Pedrasa’s article is the comments section. Some readers were keen enough to observe the article’s insensitivity and lack of taste. This entry was posted in Online and tagged abs-cbn, abs-cbnnews, ira pedrasa, makati bus blast, maximo peligro, sensationalism by Daryl Zamora. Bookmark the permalink.